Legalizing marijuana for its varied medical properties has been one of the prime topics of discussion in the U.S, for quite some time now. With a steady rise in the medical researches proving marijuana as a medical boon, a number of states have successfully voted and legalized the use of weed as a medicine for a number of diseases. However, for the first time ever, a state in the U.S has legalized marijuana, not by votes but by the stroke of a pen. On Monday, 22nd January, Vermont Gov. Phil Scott (R), signed and got into action the House Bill 511, a law which legalized the possession of cannabis up to 1 ounce and also gets rid of the penalties associated with the possession of 2 mature marijuana plants and 4 immature marijuana plants. However, the legalisation made doesn’t state anything about the huge market of recreational weed. The law passed will get into effect sometime in July. Signing the Bill, Vermont joins 8 other U.S states that have legalized weed, thus growing the movement with Washington, D.C., against the other states and the Federal law that classifies marijuana as a drug or as a Schedule I product like LSD and heroin. 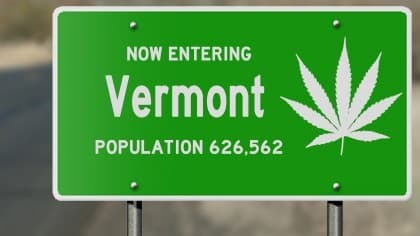 In 2004, Vermont had legalized medical marijuana and is one amongst the 30 states, also including territories of Puerto Rico, Guam and also Colombia. Previously, all the other states that had legalized marijuana, had undergone the ballot process, thus leaving the decision on the voters. But in the case of Vermont, the decision was based on the lawmakers who had been working already on reforming the usage of marijuana through law. According to sources, a similar marijuana legalization bill was made in the year 2017, but was banned by Governor Scott due to his concerns over the docile language used for the punishment of minors if found buying or using marijuana and to also understand the working of a regulated marijuana market in the state of Vermont. Speaking about the legalization, some of the state officials said that the composition of the commission seems more biased against marijuana, indicating that the future of recreational weed may be doubtful in Vermont. Vermont Lt. Gov. David Zuckerman, who is also a Democrat said, “There is frustration that the governor’s panels appear to be predetermined in opposition [to a tax-and-regulate model for marijuana sales] versus the sentiment of the House and Senate, which was to move forward,”. The final report of the Governor’s commission will b delivered to the lawmakers by the end of this year. The report will guide the lawmakers on the future legislation on establishing a recreational market for marijuana. Based on Scott’s 2 step process of the legalization, it may take some time for the First Legal Marijuana Sale. Overall, it is not clear yet whether the bill will be passed with enough support in the Vermont State’s Legislature without governor Scott’s support. The state requires 2/3rd votes to countermand the ban, making it a major topic in the upcoming statewide elections in November.